I like tiramisu. I like the idea of it even more. I don’t make the traditional version at home because I don’t keep coffee in the apartment (for anything, ever) and Josh doesn’t like the taste of coffee anyway. Also, it’s a bit indulgent and we wouldn’t want to eat a whole tiramisu ourselves. One summer I really wanted a lighter, fresher version of the dessert though and luckily, a few weeks later Giada de Laurentiis did a raspberry version on her show and then I found a recipe for a low-cal tiramisu in Everyday Food. . I thought, I could do something with this, with a bit of inspiration from FoodTV. 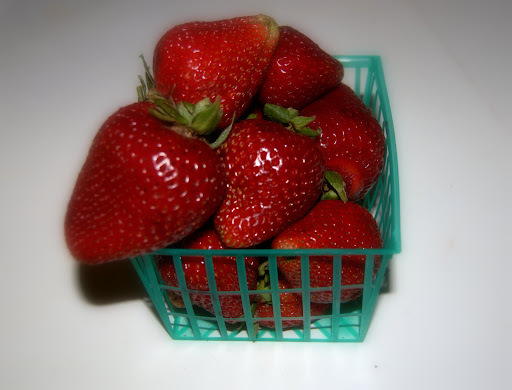 I picked strawberries because they are one of my top three favorite foods (the other two being chocolate and barbecue), not to mention healthy and delicious. Mix the cream cheese, whipping cream, and sugar until soft peaks form. Layer a little on the bottom of a large dessert pan or bowl. Cut the angel food cake into flat slices and layer on top of cream. Spread more cream on top of the cake slices, and then spread strawberry jam. Layer with more cake, and then cream and jam until almost all the cream is gone. Top the final layer with the cream mix, then top with fresh strawberries. Sprinkle with powdered sugar. Cover and refrigerate for at least an hour and a half. This entry was posted in General Musings and tagged dessert, fruit, healthy, no-bake, strawberries on July 15, 2009 by Lauren. Hey Lauren, that does look like it might work for me – thanks! No problem. BBQ tiramisu?! Be still my heart. I’ve never heard of such a thing before.